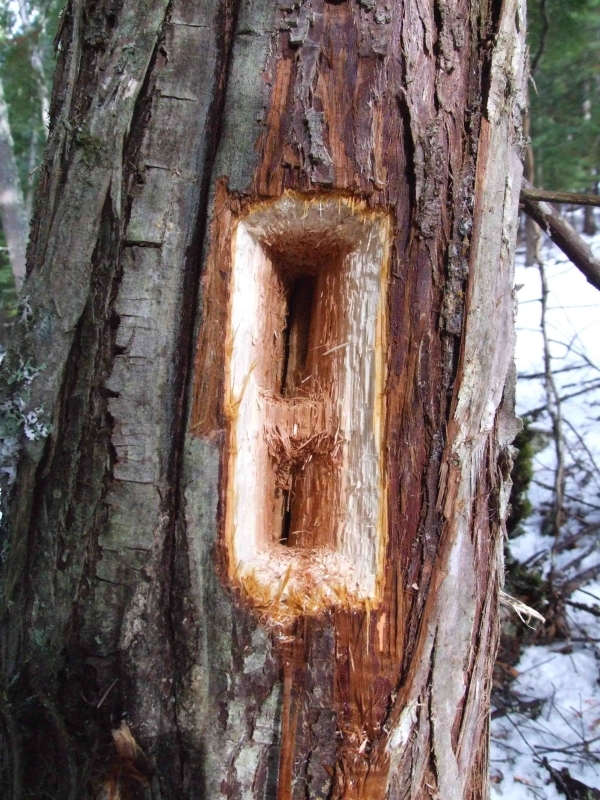 The Short Answer: These holes are classic foraging holes of the pileated woodpecker (Dryocopus pileatus), the largest woodpecker in North America (assuming Campephilus principalis, the ivory billed woodpecker, is extinct). The ones you found do look remarkably regular, as if made by a saw or a wood chisel. You must have an exceptionally neat woodpecker in your neighborhood. Carol Hartwig, a retired wildlife consultant who has studied pileated woodpeckers, says pileated woodpeckers often make square or rectangular holes. She speculates that the rectangular shape may be energy efficient. She also notes that the grain of western red cedar (Thuja plicata), which is what your tree trunk looks like, is particularly straight. Your holes are far too close to the ground to be attempts to build a nest cavity. More likely, the bird was looking for insects, its main source of food. Ants and termites are favorites, and beetle larvae and other tasty insect treats would be on the menu as well. Given the size of the hole, I’m guessing the bird was having good luck. 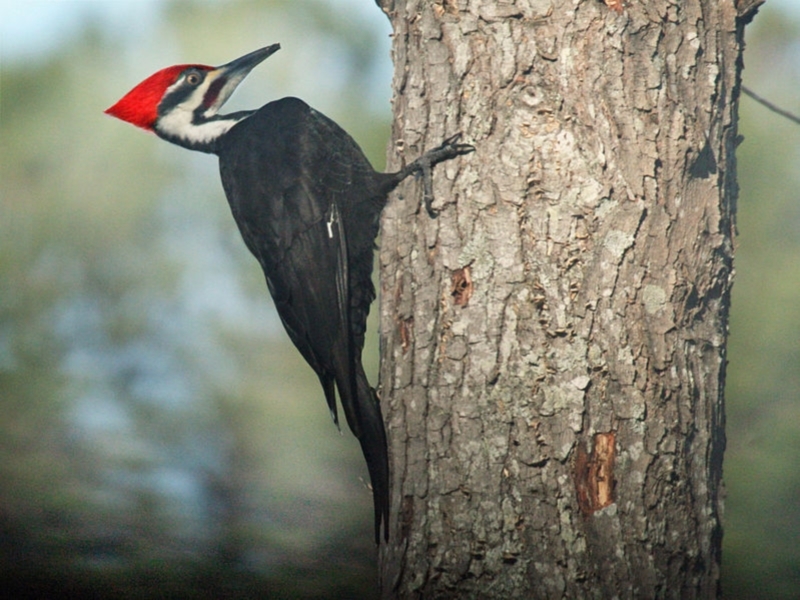 Tree Holes are in Demand: One group of researchers observing the nests of pileated woodpeckers saw wood ducks (Aix sponsa) repeatedly attempt to steal a choice pileated woodpecker cavity. The nest already contained three hatched chicks and the male woodpecker remained on guard a short distance away. When a wood duck hen would attempt to fly to the nest tree, the male woodpecker would intercept her and prevent her from going inside. However, the researchers noted one time when the wood duck hen entered the nest as the woodpeckers were off foraging and another time when the duck was so quick to the tree, the male woodpecker was caught off guard. In both instances, the male woodpecker entered the nest, a fight ensued, and the woodpecker eventually expelled the wood duck hen and retook his family’s nest. For animals that nest in tree cavities but can’t excavate their own, like the wood duck, the relatively large nest cavities of pileated woodpeckers are prime real estate. Sources: Conner, RN, Shackelford, CE, Saenz, D, et al. (2001). Interactions between nesting pileated woodpeckers and wood ducks. The Wilson bulletin, 113(2), 250-253. CONNER, RN, JONES, SD, & JONES, GD. (1994). Snag condition and woodpecker foraging ecology in a bottomland hardwood forest. The Wilson bulletin, 106(2), 242-257. Hartwig, CL, Eastman, DS, & Harestad, AS. (2006). Characteristics of foraging sites and the use of structural elements by the pileated woodpecker (dryocopus pileatus) on southeastern vancouver island, british columbia, canada. Annales zoologici Fennici, 43(2), 186-197. Cite this article as: Pelletier, TC. (April 16, 2014). 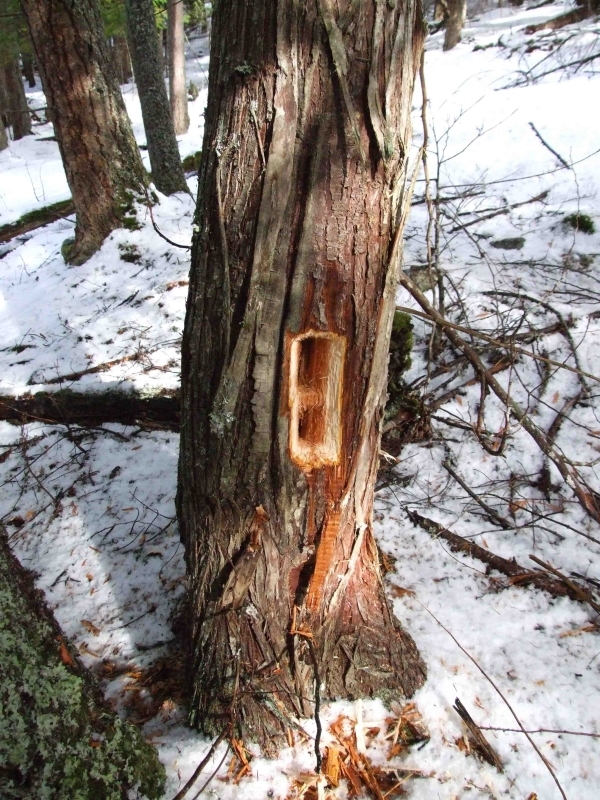 Who made mysterious rectangular tree holes? Retrieved from http://askanaturalist.com/who-made-mysterious-rectangular-tree-holes/ on April 21, 2019. Previous PostWhy does the snow melt in circles around trees?Next PostWhat are these jelly dots under rocks? Thanks, I have exactly what is described above rectangular holes and all. Still cannot believe a bird did this. I would have difficulty with a chisel. There were about five of them. Top one looks like a nest. Incredible- I have 4 or 5 of these in a large cedar tree on my property and was convinced somebody had been down there digging something out of the tree with a tool. I hope I can catch a glimpse of this magnificent creature! I just discovered two of these large rectangular holes in a large white pine in back of my home in SW michigan. They are fresh and the wood chips a re fresh and large. the wood chips are 3 to five inches in length and about 3/4 to 1 in wide. The largest of the two rectangles is about 10 in tall and 4-6 inches wide. below that is a smaller one about the same width but only about 5-6 inches tall and about the same width. My concern for the tree is that these holes penetrate all the way into the center of the tree which is about 22 inches wide. Just saw these in a cedar tree on a Maine Island, large splinters and nice rectangular holes, I would like to see the woodpecker. They have almost pecked through the tree and are well into the center of it. I have several of those in trees on my property in Manitowoc county , Wisconsin. Anyone who wants to know more can reach me at (920) 901-8071. Seem to be freshly made. I saw such rectangular holes,just like those on the photo, on a tree in the Haute-Savoie(french Alps). Do you know whether this kind of woodpecker is common in the french Alps. Hi Bertemes, there is indeed a very similar woodpecker in Europe, the black woodpecker, which is closely related to and very similar to the North American pileated woodpecker. As this Wikipedia entry shows, it also makes fairly geometric holes: https://en.wikipedia.org/wiki/Black_woodpecker. I have these in our backyard this year in 4 of our trees near Binghamton, NY. Will they kill our trees? I should add that they range from about 5′ to 20′ from the ground.